I have been appointed to serve on the House Education, Game and Fisheries, Insurance and Liquor Control committees for the 2019-20 legislative session. The House Education Committee works on state issues involving public and private schools, encompassing pre-K through grade 12 basic education, as well as post-secondary education. The House Game and Fisheries Committee receives and reviews annual performance and status reports from the Pennsylvania Game Commission and the Pennsylvania Fish and Boat Commission. It also approves the setting of license fees that support each commission and addresses all legislation that affects them. The Liquor Control committee is responsible for issues relating to the administration of alcoholic beverage licenses and the sale and distribution of alcoholic beverages. Each of these committees addresses issues that are important to the residents of the 125th Legislative District, as well as the communities across the Commonwealth. 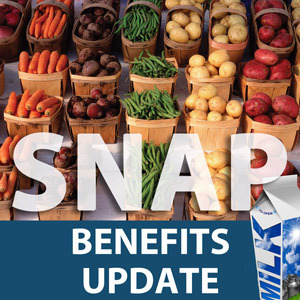 The February SNAP benefits for recipients who did not have a renewal in January, or whose renewal for January was completed by Jan. 14, were available on their electronic benefit transfer (EBT) cards on Jan. 18. Recipients whose renewal was due in January and their renewal was completed after Jan. 14 will have their benefits available the day after their renewal is processed. This is the only benefit payment SNAP recipients will receive for the month of February. They will not receive a payment on their regularly scheduled February payment date. This payment is not a bonus or an increase in the monthly payment. SNAP recipients will need to make this early payment last through an undefined period if the shutdown persists. The state is awaiting further guidance from USDA regarding the availability of benefits for March. Other benefits such as cash, LIHEAP or Medical Assistance will not be affected. To help continue efforts to fight prescription drug abuse, there is a new tool available for health care providers and the general public to report suspicious activity involving prescription medication. The Suspicious Activity Report form, administered by the Office of Attorney General, gives an easy way for people to report fraudulent, stolen or altered prescriptions, or a suspicious doctor/pharmacy. Tips can be submitted anonymously or with your contact information included for follow up from the Office of Attorney General’s Bureau of Narcotics Investigations. The form and answers to frequently asked questions can be found here. The statewide Safe2Say tip line designed to give students, teachers, parents and community members the ability to anonymously report potential threats and other problems is now live in Pennsylvania. To report a possible dangerous or violent situation, individuals can call the state tip line at 844-723-2729. Tips can also be reported to safe2saypa.org or through the Safe2Say app on iPhone and Android devices. Individuals, without fear of repercussions, are encouraged to report physical or verbal assault and bullying, discussion about an upcoming planned attack on the school or a person, depression, excessive guilt or hopelessness, suicidal threats or self-harm, substance abuse, or social isolation or withdrawal. The tip line was modeled after the Safe2Tell program in Colorado, which has received more than 30,000 reports since its inception in 2004, including reports of a planned school attack, suicidal threats and child abuse. The winter brings the dreaded flu season, but there are many things you can do to keep yourself from getting sick. The most effective way to prevent the flu is to get a flu shot. While it is January, there is still time to get one to protect yourself. Along with getting the flu shot, people should make sure to wash their hands often, cover their mouth and nose when sneezing, avoid touching their face, and stay home if they are sick to avoid spreading the disease. You can learn more about the flu and the vaccine here.